Ugly is found in the adult section of bookstores but it is really for everyone. 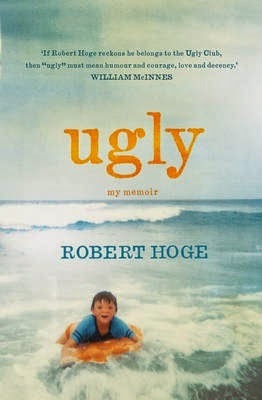 A giant tumour distorted Robert Hoge’s facial features at birth to such an extent that his mother refused to look at him. His legs were twisted and useless. Robert’s story of his years of struggle and triumph from birth to adulthood, supported by his family (including his mother) opens doors to understanding disability. But Ugly does more than just tell a story. Robert makes his journey personal and shares everything as with a friend. He is brutally open about what hospital, school and home life held for him, yet he is also disarmingly honest about his feelings, which are not always what you would expect. Ugly spotlights Western Society’s obsession with beauty without ever mentioning it directly. Ugly also strips away our world’s padding and pretence and reveals other values that might just be more substantial. Robert’s incisive comments echoed in my mind long after the book was finished and shifted my lens on life. There is drama and action within Ugly. In some ways, these moments were more spine-chilling than gruesome Sci Fi scenes because they are real. Having now read Wonder by R.J. Palacio, I realise that Robert Hoge’s Ugly is an Australian historical non-fiction version of Augustus’s tale. Format: Paperback. Also available in ebook format.